A short video of the BayTrailrunner's Whiskey Hill Redwood Run from last weekend, on my home trails in Huddart Park, Woodside, CA. Enjoy! My mother and I have always had the greatest intentions for State College, PA. Over 25 years ago, this was to be her new hometown, teaching at Penn State while my step-father made the most of his retirement fixing up an old house in the college district. Life threw in an unexpected twist, and it became a path not taken, forever a "what if" in her life journey. 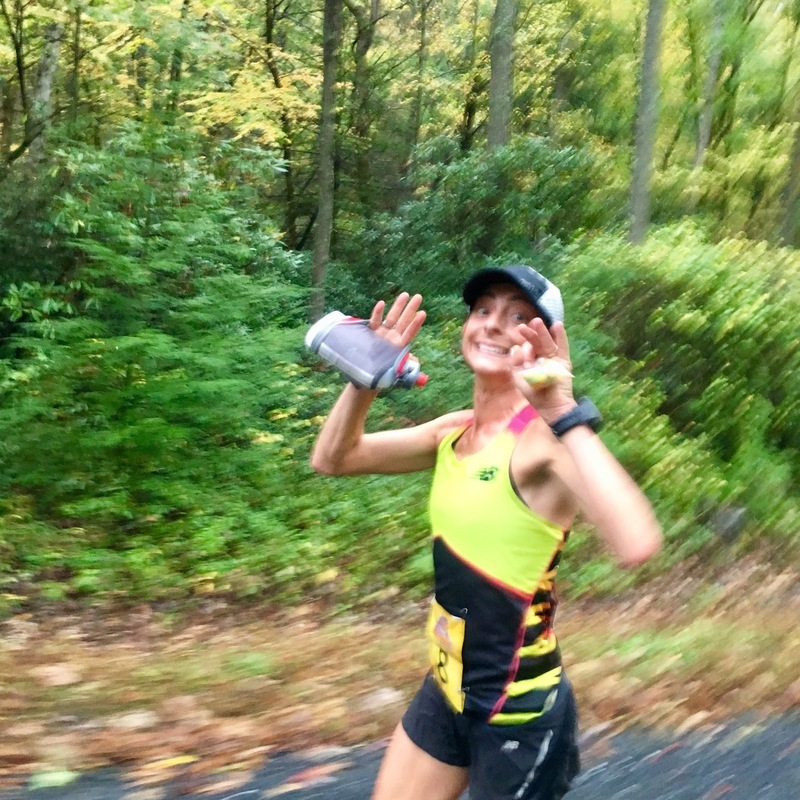 This last weekend, she returned to State College to crew for me at the 2017 Tussey mOUnTAiNBACK 50-mile run (her first crewing experience), where I would use my fitness and course experience to cruise to an easy finish, needing little more from her than a few pictures. Um, yeah...that didn't quite pan out either. But it was a worthy adventure, full of vivid Fall colors, miles of cramps, and some shared adventure that gave my Mom a good taste of the voluntary suffering that is the ultramarathon. The best laid plans of Moms and Men, I suppose. Mom (aka, Dr. Diane Dunlap) was more optimistic for the 85-degree humid air than I was, relishing any east coast Fall/Winter day that didn't involve sub-zero temperatures. For an unacclimated runner, I explained, it meant a struggle with core temp right from the gun, followed by a losing battle with dehydration, and the oh-so-fun "find the chafe spot" post-race shower that feels like angry ghosts armed with heat-seeking cattle prods. She got a good laugh out of that one, asking what she could do to help. Just be there, I said. Flat Coke, pb&j squares, and Vaseline for back up, but really, just be there. "That's what Moms do," she replied, and she was right. Although it had been a few decades, this was certainly not be the first time she stood in the rain for hours so her son could get muddy in the name of sport. It took a lot of courage for her to be here, not just for the race, but to revisit a place where her life could have been. This became clear as we drove the streets looking for the house she had once bought but never moved into. By some stroke of luck (and her impressive internal compass), we found it, and she quickly pointed out all the home projects that David (my step-dad) had been ready to tackle. That would be the master bedroom, the library would go there, you should see the workshop...she recalled every napkin sketch he had scribbled just days before the move while they were on a retirement vacation in Australia. When David died of a heart attack on that same vacation, the plans for State College ended just as suddenly. Now there are just memories of sketches of a house almost lived in - a path nearly forged with the best laid plans. The warm rain was in full force when we lined up to race, but it was quite pleasant. Mom was a little nervous, but knew that the course layout of 50 miles of dirt roads meant she would see the runners along the way throughout the day. We wished each other luck, and RD Mike Casper sent us off down the lush forest roads. I cruised along with Mike Ryan from Ohio, who had his sites set on fellow M50-54 runner Jean Pommier a few yards ahead. David Roche, Joel Frost-Tift, Anthony Kunkel, and a half dozen others were already well into the distance at a 6 min/mile pace. As we crossed the first aid station (mile 4) and leaned into the downhill, the rain parted to show a glorious canopy of fall colors. I found the familiar stride of Liza Howard (forever famous in my mind for breast-feeding a newborn while winning the Rocky Raccoon 100m), and tagged along with her effortless form. We knew we were going too fast when we cut through a pack of 20-somethings while saying "old people coming through", so eased up after the second aid station. I found my Mom at mile 11, and she got me set up with more Vespa, Vitargo, and snacks. I had fooled myself in to thinking I could "bank time" in the cooler early hours, but was pretty sure any tactic was not going to hold off the humidity. 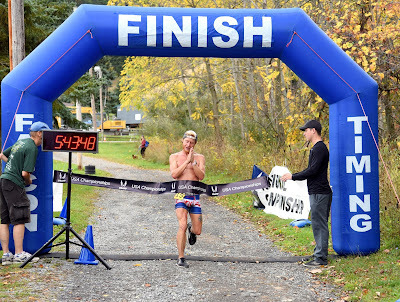 Over the next couple of miles, I chatted with local Josh Litofsky about his breakthrough race at Kettle Morraine, his six person crew (cheering the most of anyone), studying chemical engineering, and his desire to break 7 hours at this race after a few solid finishes here. We took on the big climb together (mile 25), before he noted he needed to pick up his pace and pulled ahead. There had already been a lot of people dropping up front, and we found ourselves in 6th and 7th place much to our surprise. 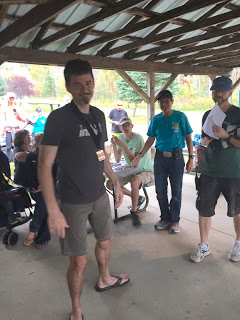 I got through the first 50k (3:47) before the twitches of cramps showed up, and those twitches soon spread like wildfire through my quads and hamstrings. Grrr! I pounded a few more S! Caps, but knew the cramps were evidence of a deeper hydration problem, forged in a lack of training/acclimation. I stopped to chat with my Mom, letting her know this was one was going to be a slog. She still smiled...she was having a blast meeting all the crew, volunteers, and their dogs. Despite the required walk breaks every half mile, only a few people passed me, so I suspected I wasn't the only one suffering. Every aid station had people dropping, including all the lead women up to Liza (go, Liza!). Mike Ryan went by quickly, so I suspected he might give Jean a run for his money. I felt like I was going SO SLOW, but my Mom kept saying I was making up time. Just keep going! The gold and amber leaves kept my gaze up in the last 10 miles, a nice crutch to my crumbling form. At one point my cramps seized so much I fell over, and I almost couldn't get up! It's been a while since I've felt that messed up, but all you can do it get up and keep going. Just eight more miles...six more miles...three more miles...oh, thank god, there's the finish chute! Ninth dude in 7:34, third Master, and the only one of eight in my age group that didn't drop. All hail, the slog king! Anthony Kunkel (5:43) had moved into first on the big climb, and steadily distanced himself from the pack for a decisive win. 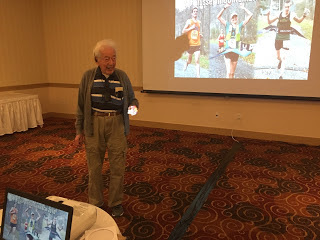 Best of all, he stayed on course this year (he took a six mile detour before the first mile marker last year)! 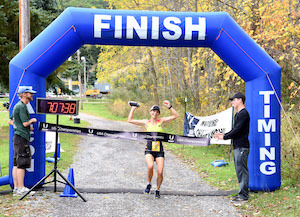 Liza Howard (7:07) won the Women's division (and Masters), with Jean Pommier (6:39) blazing to a Masters win as well. Aside from Anthony, everyone seemed to have struggled with the humidity, but had the fortitude to find that finish. Ah, the best laid plans of Moms and Men. But today, it was a team victory, and a chance to create a new family chapter for State College, PA. My thanks to my Mom, Mike Casper and the volunteers, and my fellow adventurers for a day well spent!